Born in Kiev, Ilia Korol (Violin) studied violin at the Music Academy Moscow with Abraham Stern and Marina Iashvili. Since 1997 he lives in Austria, where he was rewarded 2001 with the Austrian citizenship due to his musical merits. He appeared with Musica Antiqua Cologne, and performs as concertmaster of Joshua Rifkin?s Bach Ensembles, with the Spanish Barock orchesters RCOC, with the Vienna Academy of Music and furthermore, he is member of the Ensembles Ars Antiqua Austria and the Clemencic Consorts. He recorded several CDs and performed as a member in reknown ensembles at the most important festivals in Europe, Asia and the United States. 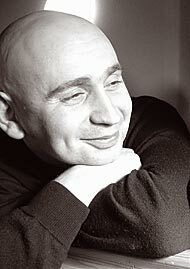 In 2003 Ilia Korol founded together with Julia Moretti the chamber orchestra moderntimes, that was one of the opening orchestras of the Vienna Festival in 2004, that gave a guest performance at the Ruhr Triennale in 2005, and that was invited to the Salzburg Festival in 2006.